2. Vocabulary: Academic vocabulary (Tier 2 & 3 words) in bold print throughout reading. Vocabulary chart, adapted from Learner's Dictionary, at the end of reading with definitions. Parts of speech and singular/plural words are also identified in the chart. 3. Spelling Practice: Students unscramble vocabulary words and write the correct spelling in sentences based on the reading. 4. Vocabulary Practice: Students complete cloze sentences with the correct vocabulary word. 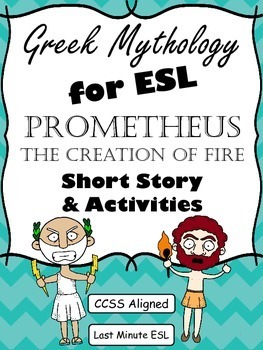 Sentences are out of the context of the reading. 5. Grammar: Students conjugate verbs from reading into the past tense. 6. 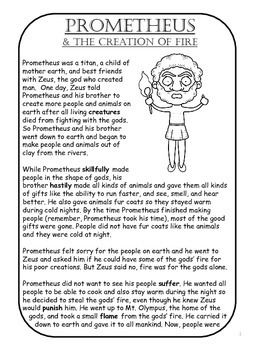 Sequencing Main Events: Students order the main events of the story. 7. 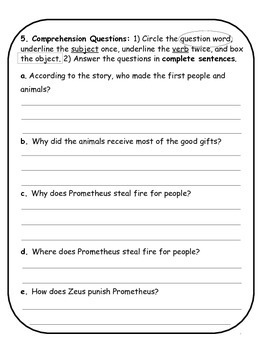 Reading Comprehension: Students annotate text dependent questions (aligned with CCSS) by circling the question word, underlining the subject once and verb twice, and boxing the object. Afterwards, they answer the comprehension questions using complete sentences. 8. 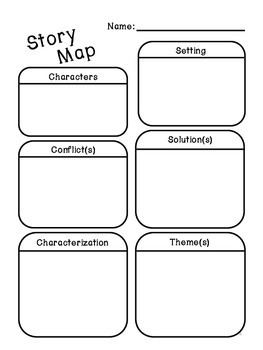 Story Map: A graphic organizer in which students complete sections on the myth's literary elements, such as: characters, setting, conflict, solution, characterization, and theme.